Luton skipper Alan Sheehan revealed he had been counting down the days until he could return after his recent three game suspension. 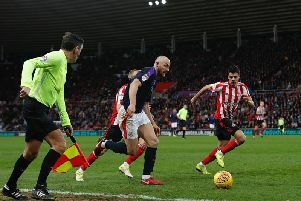 The centre half had been banned for an off-the-ball incident with Lincoln striker Matt Rhead on January 1, and missed matches against Newcastle, Chesterfield and Morecambe. I’m happy to come back in, it’s been, 27 days, I’ve been counting it down. He was back in the starting line-up at Grimsby on Saturday as Luton, reduced to 10 men after half an hour, battled to a 1-0 win. Sheehan then played in the 3-2 defeat to Wycombe in midweek, but after the victory over the Mariners, said: “It was straight out of the grill and straight into the oven, it’s mad isn’t it? “It’s hard, but that’s the way it is, no game is going to be easy whether we’ve got 11 or 10 men. “I’m happy to come back in, it’s been, 27 days, I’ve been counting it down. Sheehan certainly had to do his fair share of defending at Blundell Park, but knew just what a crucial result it was for his side’s promotion ambitions. He continued: “We had to dig really deep and it’s what this team is capable of doing. “We battled out a brilliant 1-0 win and I think we can call it that definitely at this time of the season, to dig out a win like that is brilliant. “It’s difficult with 11 men, even more difficult with 10 men, that happens, it’s football, those things get thrown at you. “You’ve got to respond, you can stand up and be counted, that’s exactly what we did. “I felt quite comfortable, we were very strong defensively, and I thought we were in a good place. Despite Cook’s red card, Luton didn’t close ranks and accept a point, as they still looked for a winner that came from James Collins. Sheehan added: “I suppose most teams when they go down to 10 men away from home they shut up shop but I don’t know if we have that really. We want to win every game and you can’t win every game, but we want to win every game.